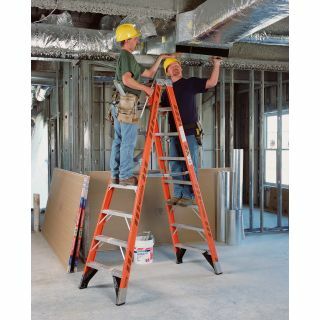 The T7418 Fiberglass 18 ft Twin Step Ladder features a duty rating of 300 pounds per side of the ladder. 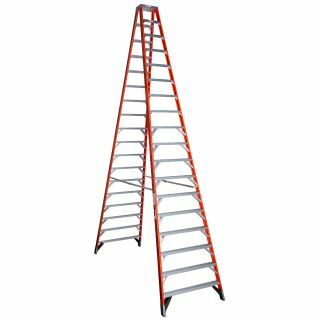 Designed for one or two-person jobs, the T7400 ladders have heavy gauge aluminum tops and feature heavy duty internal spreaders to resist damage around the worksite or in transit. The GLAS*MARK® Violater stripes on the rails make the ladder more visible and the EDGE® bracing system and external rail shields add to the long lasting durability of these ladders. Fiberglass rails are non-conductive for working near electricity.